Joel: Not to put too fine a point on it, O'Connell, but has it occurred to you that there might be certain romantic implications to us being stranded out here in the middle of nowhere? Maggie: In your dreams, Fleischman. 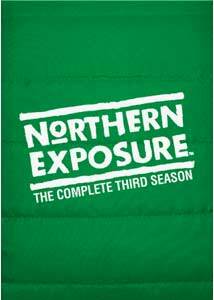 Debuting as a mid-season replacement in 1990, it would take until its third year before Northern Exposure would finally get what would normally be considered a full season, with only eight and seven episodes comprising the first and second seasons respectively. The 23 installments here are many of the show's finest, and this may be the best of the show's six seasons—in that year it was nominated for 16 Emmys and won six, including Outstanding Drama Series. By now, the characters in the series are fairly well defined, and the ensemble cast continues to excel in their roles, expanding on their many quirks and eclectic personalities, and everyone gets more development as the show progresses. The writing never fails to come up with new and bizarre situations while also working in the continuity by addressing or referencing events of previous episodes frequently. One of the best parts of this series is how so many absurd scenarios can come off as convincing, due to the broad mix of characters and flawless performances. Some of these stories are way out there. Dyed-in-the-wool New York Jew, Joel Fleishman (Rob Morrow), has finally come to terms with his situation after being railroaded into paying off the financing for his medical education by serving as the doctor for the remote Alaskan community of Cicely, a place about as far removed from his roots as conceivably possible. While he may be adjusting to his new surroundings, it doesn't mean he is fully prepared for many of the customs of his new community, or some of the patients he has to contend with. Dumped by his former fiancée, the now single doctor has a potential love interest in town pilot Maggie (Janine Turner), whose latest boyfriend has succumbed to the "O'Connell Curse," having recently been killed by a falling satellite. But their relationship is hampered by strong and often opposing personalities, not to mention a distrust of the other's intentions. In the season opener, The Bumpy Road to Love, Maggie learns that boyfriend Rick had a few secrets in his closet after one of his lovers turns up for the unveiling of a statue in his memory. Maurice believes he has found a soul mate in tough cop Barbara Semanski, but Barbara's interest is shaken upon the discovery of some of Minnifield's business practices. Adam (Adam Arkin) returns to kidnap Joel in order to attend to the medical needs of his hypochondriac wife, Eve (Valerie Mahaffey, who would beat out Cynthia Geary's Shelly for the Outstanding Supporting Actress in a Drama Series Emmy). In Only You, Joel is fascinated when Chris (John Corbett) suffers the recurrence of a condition that makes him irresistible to women. Maurice is infuriated by the portrait Holling (John Cullum) shot of him, and Maggie faces a crisis when she discovers her eyesight is failing. Oy, Wilderness finds Joel and Maggie stranded after her plane develops engine trouble, while Shelly gets a visit from her former best friend who is planning to marry Shelly's (Cynthia Geary) husband back in Canada. Maurice tries to convince Marilyn to start a co-venture with her ostrich farm, and Maggie believes a stray dog is the reincarnation of Rick in Animals 'R' Us. Morrow gets a dual personality when his evil twin brother shows up in Cicely, which causes some embarrassing moments in Jules et Joel,, which also finds Holling repaying an old debt and Chris dealing with a notorious criminal from his old home town. In one of the season's more popular episodes, the discovery of a frozen Frenchman turns the town upside down. Meanwhile, Shelly is questioning her fertility, and Holling is avoiding dealing with his ancestry in The Body in Question. A surprise visit from ex-fiancée Elaine (Jessica Lundy) has Joel in a fit, while Bernard's (Richard Cummings Jr.) return has Chris dreaming of Africa, and Adam takes up as cook at the Brick to pay his insurance premiums in Roots. Joel decides he must go hunting to back up his criticism, and Ed (Darren E. Burrows) begins to worry when he learns Ruth Ann's age in A Hunting We Will Go. The Cirque du Soleil make an appearance in Get Real, which finds a band of circus performers stranded in Cicely, as Marilyn is wooed by a silent performer, and Holling becomes fixated on Shelly's feet. In the Emmy-winning Seoul Mates, Christmas affects the town citizens in different ways: Shelly longs for the rituals of her upbringing, Joel tries to experience his first tree, Maggie gets unexpected news from her parents, and Maurice's values are questioned when his son shows up unannounced. In Dateline: Cicely Maurice covertly hires Adam to write for the town paper in order to improve its readability, but his stories cause controversy; Chris becomes half-owner of the Brick to bail out Holling; and Maggie begins to hear trees talking. Joel has second thoughts about going native after Marilyn convinces him to be adopted by one of his patients, and Maggie becomes concerned when Holling closes the Brick to wax the floors while Shelly is away in Our Tribe. Holling retreats to his still when he has a mid-life crisis after his uncle dies, Joel discovers Alaska isn't a haven for Jews, and Ed finds a film subject as Things Become Extinct. Maggie gets a surprise visit from her mother, who has news that is even more upsetting, Chris is making plans to fling a cow, while Joel believes he has discovered the secret identity of the local chimney sweep in Burning Down the House. Holling's reign as mayor is challenged as Cicely discovers Democracy in America,. Fulfilling a promise made years before, Holling and Maurice set out to bury an old friend in a remote location, but neither is prepared for what they will find, including the man's amorous widow, in Three Amigos. Lost and Found sees the return of Eve to Fleishman's office with the latest of her many maladies, while Joel finds out a previous occupant may be haunting his cabin. Maurice receives a visit from an army commander he worships, but is in for a let down. The town becomes matronly when an infant is abandoned in Joel's office, and Shelly is less than enthusiastic when her mother shows up with a boyfriend Shelly's age in My Mother, My Sister. Spring is in the air, and bears abound. Maggie meets a mysterious stranger, Shelly is suffering from a rash, and Joel gains some new insights on health care from Marilyn's cousin in Wake Up Call. In The Final Frontier, Maurice's nose gets out of joint when he discovers that Ron and Eric have turned the dilapidated bed and breakfast he sold them into a mecca for Japanese tourists out to see the Northern Lights. Maggie stirs the town's curiosity about a mysterious parcel, and Holling sets out to find out whether Jesse is still alive. With a bambino on the way, Adam and Eve are planning their nuptials after having lived together for a dozen years, and while Adam is adjusting, Eve is highly reluctant to take the plunge. Meanwhile, back from Juneau, Joel and Maggie's relationship has turned awkward, and doesn't get any better when Joel tries to clear the air. Finally, Joel learns the story of how the town was named from an old-timer and former resident in Cicely. The cast gets period attire to tell the tale in this Emmy-winning episode. There are few shows that could pack a season with one great episode after another, but Northern Exposure does just that with nary a bad installment in the bunch. Image Transfer Review: Image quality is extremely good for the most part, with only stock shots or the odd scene looking below par. Colors are solid and well saturated, and black levels are deep and even. Detail is distinct, there is only very minor aliasing in a few places, and no sign of edge enhancement. Audio Transfer Review: The stereo surround track is well presented, with no technical deficiencies to speak of. Tonal balance is nice, and there is a pleasing amount of directionality. Dialogue is easy to discern, and is not overly sibilant. Universal has indicated on the package that, like the second season, some of the music is not original, however without a comparison, I could not pick out anything blatent, and it appears that the more prominent pieces are intact. Extras Review: The first thing to mention is that, not surprisingly, the third season gets a change in packaging, switching from a dual keepcase to three thinpak cases in a box. The parka is gone, with the outer box art emulating the appearance instead. On a positive note, each case now sports an episode guide with a brief synopsis, making it a lot easier to find the episode you're after—although you'll have to deduce which side of the disc they are on (there are four episodes on side A). Menus are simple and pretty much identical to previous seasons. There is a Play All feature, an episode index, brief synopses for each episode, plus an index of the bonus features on the disc. There are four chapters per episode available from the menu, and the chapter mark immediately following the opening credits has returned. Those wondering if the collection of deleted and extended scenes found on the first and second seasons were only there to help justify the high per-episode cost will be pleased to discover that not only has Universal continued the feature on every episode here (running from one to six minutes each for a total of 1h:05m:51s), they have also included more "unexposed" footage (18m:20s total), including Ed's Cutting Room Floor: Unexposed Documentary Footage, a black-and-white collage of scenes set to music, plus bloopers Forgot Your Lines? and Laughing Matter, both of which are pretty self-explanitory and Those Crazy Cicelians,, which has the cast goofing off. It should be noted that the language here is not suitable for younger family members. There's also a collection of lost storylines from episodes Jules et Joel (12m:49s) Seoul Mates (2m:27s) Things Become Extinct (6m:12s) and Three Amigos (5m:04s) on the third DVD. That's just under two hours of unseen footage. Trailers for Law & Order: The Third Season, Father of the Pride and In Good Company can be found on Disc 1. As the first full-length season of Northern Exposure, this set is packed with great episodes, and the show continues to deliver its eccentric, yet intelligent humor, side by side with some tangible human drama. Although the set continues to be a fairly minimalist package, and it may not be 100% intact, Universal has put the money where it counts—the quality of the presentation, and more great extras. Very highly recommended.